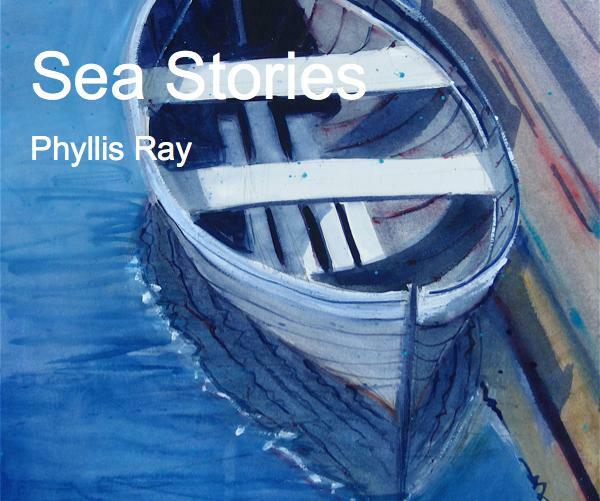 When local painter Phyllis Ray handed me “Sea Stories,” I didn’t know what to expect. I knew she was a painter, but I had not known that she was also an author. “Sea Stories” is a self-published journal of Ray’s three-year nautical adventure aboard several smallish vessels on which she provided her services as cook, deckhand (and sometime lover) to various seafaring skippers. The book follows her travels as a hitchhiker of sorts by boat from Chesapeake Bay to the Azores, islands off the Portugal coast, back across the Atlantic Ocean to the Caribbean, and finally across the Pacific Ocean with a series of stops among the South Pacific Islands, New Zealand and Australia. She was a 47-year-old single mom when she began; a woman who was ready to sell all her worldly possessions and go on a grand adventure. 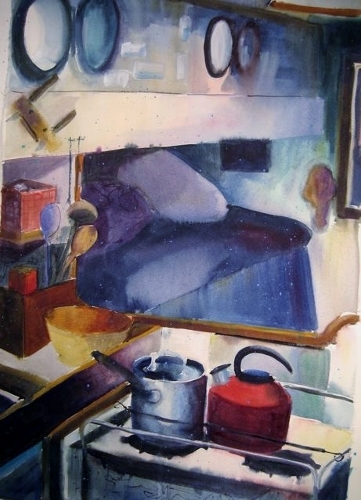 The galley aboard the “Varde,” watercolor by Phyllis Ray. Indeed, the book is part primer for anyone considering sailing the world by small boat complete with the author’s tips on how to stock the sea-bound kitchen with supplies for a year (stay away from preservatives), and part diary filled with stories of the characters she meets while socializing, working and creating friendships among the ports of various parts of the world. It also includes the sticky parts of being on a boat with another person for too long, particularly “the naked skipper” with whom she strikes up a relationship and becomes complicated in the end. 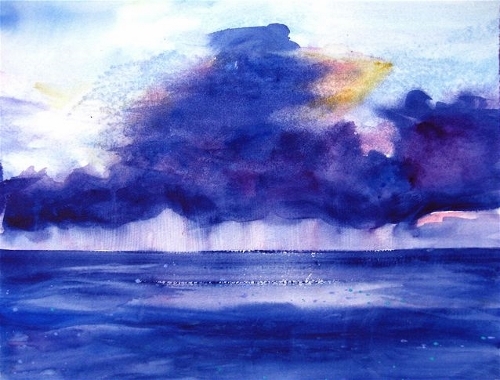 “Squall in Mid Ocean,” watercolor by Ray. 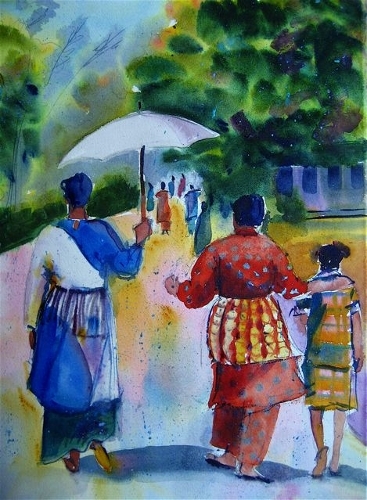 “Women of Tonga Walking to Church,” watercolor by Ray. The diary part of the book is filled with ruminations on the effect of the ocean (mid-ocean becomes one of Ray’s fondest memories of a place and she tries to convey its deep serenity) and the invaluable relationships she strikes up with the women friends she meets. She also tells stories about the exotic foods she eats with people in far-flung parts of the world and expresses her views through her paintings; the feel of the people who inhabit the places she goes, such as Tonga and Tahiti. The paintings that pepper the book give it one of its most pleasurable qualities. But like so many eager folks itching to tell their grand adventure story to the world, this book lacks polish, which is a shame because within it are plenty of interesting tales. Ray is a painter, not a writer, and the strength of the stories told through the paintings outshine her ability to write. 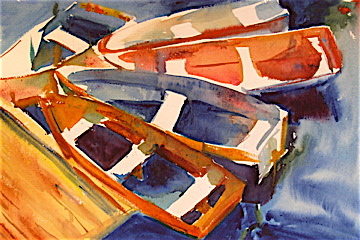 “Dinghies,” a watercolor by Ray. I would have suggested that Ray give the book a more streamlined structure and avoid the temptation to tell overly detailed personal stories, diary-style. 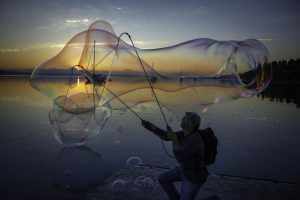 Without a professional editor, “Sea Stories” misses the chance to shine as the excellent adventure of a middle-aged woman exploring not only the high seas, but also herself. Although I have problems with the book’s composition, I give Ray credit for taking the time to get her story down in some form and give herself the chance to express emotionally what she gleaned from her travels. It’s not easy to reveal oneself so nakedly, but Ray does just that. She throws caution to the wind, just as she did when she stepped aboard that first boat. “Sea Stories” is available online. Check out Ray’s painting blog here. Ray’s Studio 106 in Langley is available for viewing during the first Saturday Artwalk in Langley each month. Great story, Patricia. Makes me want to definitely check out the book. 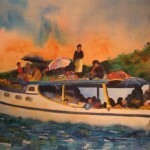 Lovely paintings, high sea adventure, love. Life to the fullest.